My thanks are due to Denis Duncan for his help and guidance, to Tony Collins for many useful suggestions and to Sue Ryder for permission to publish the prayer found at the Ravensbruck Concentration Camp. The Scripture quotations in this book are from the New English Bible. This book is a personal response to the amount of suffering that I have witnessed among the many to whom I have ministered and, even more starkly, in my own life. It has become obvious that the problem of evil in the face of a loving God is not to be solved at a purely intellectual level. The human mind, in grappling with this enigma, brings God down to its own level, thereby degrading Him and obscuring its own sight. On the contrary, it is by traversing the valley where death casts its long shadow that the sufferer learns basic truths about his condition. If he has the courage and the faith to proceed along the perilous path of self-discovery, he will come to the other side of life a changed person who knows God rather than merely believes in Him. For, as Pascal learned in his momentous illumination, the God of Abraham, Isaac and Jacob is of a different order from the God known to the philosophers. In this strange life we grow through adversity rather than through success. The greatest lessons we have to learn are those concerned with loss, not gain. Although worldly wisdom emphasises the importance of winning the race to success and affluence, the spiritual path teaches us how to become good and gracious losers. The man who seeks his life will lose it when he dies, but the man who is prepared to lose everything he possesses for the sake of righteousness, enters a new field of experience that is completely at variance with anything he had previously glimpsed. That these considerations are not entirely the fruits of individualistic piety is attested to by the situation of our world at the present time. Twenty years ago we were all living on the crest of a wave of idealistic as well as materialistic splendour. The sky alone appeared to be the limit to our endeavours, and those who penetrated into the future saw marvellous technical advances in store for the human race. Today those who are attuned to the spiritual situation see disaster ahead as the world's resources crumble away and man's innate cruelty asserts itself once more in political and religious excesses in many countries. If we are to be saved from the power which God has given us, we will need to undergo that change in consciousness which is the precious gift of those who have learned the lesson of renunciation. As St Paul writes in II Corinthians 6:10: "In our sorrows we have always cause for joy; poor ourselves, we bring wealth to many; penniless we own the world." 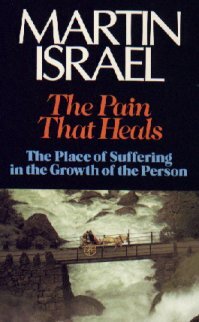 This book asserts the creative potentiality of suffering and looks for a wider ministry of healing than that designed merely to smooth out life's difficulties. Its message will give cold comfort to those who want instant relief, but to those who are prepared to proceed with their difficulties with courage, it will show the way of advance that has been tried and proven by at least one traveller on the way.